Nutronix, by Nutronix International and found at nutronix.com, is a troubled multi-level marketing business that sells health and beauty aids online and through distributors that join the MLM membership. I always tell you that the only ones in multi level marketing that make any money are the guys right at the top, and that those way below, rarely make much if anything at all. In fact, most of the time, operations such as Nutronix get people to buy their products in bulk. Most people don’t have much experience in MLM and before they know it, they’re stuck with a bunch of inventory they can’t even give away. This particular one, Nutronix has been known to scam people out of their earnings by canceling the revenue programs right when it’s received enough money to change the operation. Many distributors have reported complaints everywhere online. The biggest scam Nutronix has run is getting investors to put money into production of an infomercial that they promised to air nationally over a hundred times. It was produced for a pittance and aired a few times on small local stations. The investors could not get their money back, nor were they able to get leads from it as a result. No one was contacted and their calls and emails were never returned. No apologies or explanations came from their headquarters either. 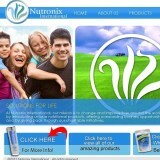 The FDA itself has investigations going on Nutronix, claiming the product is unsafe. Apparently one of their vitamins is synthetic and turns into a tar substance in high temperatures. When you consider these factors and the high risk of success in any MLM, and then see reports of Nutronix cheating distributors of their earnings you will see that this is a scam and you should not get involved with it.